"I am not comfortable with the term actor of colour. I'm an actor and I am there to play a character," Vir told IANS. "My colour is secondary to my talent. So to me, these are the larger questions that I don't think about. I am an artiste, and for me it is about how can I make the line from the page sound good," he added. 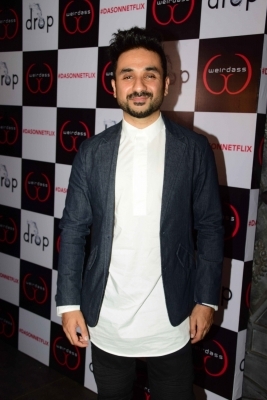 After spreading laughs with his comedy tour and Netflix specials, Vir is making a name for himself with his dramedy FBI series "Whiskey Cavalier", which is aired in India on Colors Infinity and streams on Amazon Prime Video. "I had never done American TV before. I am happy to be part of the project. I am a small part of a very big show," he said. Talking about Indian stories finding a place in the narrative in the West, Vir said: "We are the second largest audience in the world. You can't ignore that... And we have stories that need to be told and stories need to be catered towards us as well. "We watch 'Game of Thrones' as much America watches it and we watch 'Avengers' as much anybody else watches it. "So, representation is important. Diversity is important. But the right kind of diversity and representation is important." Vir, who was named one of the world's Top 10 comedians to watch out for in 2017 by US-based Variety, asserted a need to create "nuanced and layered characters". "For me, it is not about nationality or about colour, but about identity. Is there something which you can put in your character that is uniquely you and that your people will identify with? It is less about roles and more about characteristics." Apart form comedy skits, Vir has featured in films like "Delhi Belly", "Badmaash Company", "Revolver Rani", "31st October" and "Shivaay". He is actively working on producing content. "This year, there will be one or two Bollywood films, another Netflix special and hopefully more American TV shows. We are now looking forward to produce at least three or four shows. We will kind of become the destination for writers and comedians and filmmakers to come in and say â€˜If you have a crazy idea that you don't feel anybody else gets, then we want to be the production house that produces it'.